In a highly saturated market it isn’t surprising to see case manufacturers producing similar results – whether we’re looking at hardware support, cooling configuration, construction material or even internal layout. Capturing attention is no mean feat, but we feel that Cooler Master has developed something quite unique with the TD500. While the internal layout and features aren’t exactly ground-breaking, the external styling is definitely a head turner. The diamond cut design on the side panel and front of TD500 add extra flair and this helps to diversify with innumerable options out there. The front and side are likely to attract dust/marks quite easily but thankfully Cooler Master has included a micro fibre cloth which can used to keep such dirt to a minimum. 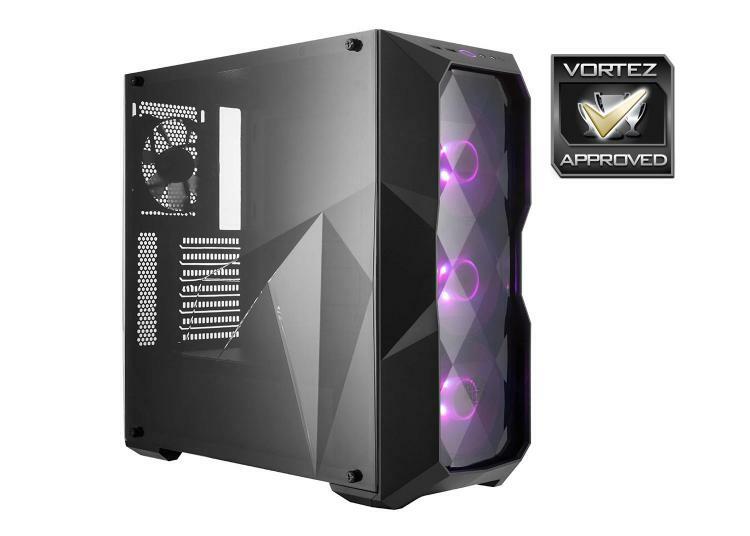 The inclusion of four cooling fans is very generous for the asking price, especially when three of them are of the RGB LED variety. As can be expected, having the presence of so many cooling fans and in key areas to create a push-pull configuration, translates to superb cooling potential. Albeit, with a slight trade-off – noise. Inside, we found TD500 offers flexible hardware support regardless of the component in question. This chassis isn’t exactly massive, but it still accommodates a selection of different sized radiators for those wanting to go down the liquid cooling route. Cable management within this case can be tricky, which is down to a combination of limitation clearance behind the motherboard tray and lack of cavities to store cables. Extra care will need to be taken to create a clean, tidy arrangement on the front and backside. There are a few areas which we feel could be improved and while not detrimental to the purchasing of TD500, are worth mentioning. There is no dust filter at the front which is short sighted, especially given we have three cooling fans; dust build up is likely to occur quite soon. The PSU does arrive with a filter, but not in the form of a removable tray. Instead, we have just a thin, flimsy cut-out of mesh – which, to remove will need the case placing on its side. The MasterBox TD500 arrives at a cost of just $75 USD / $119 AUD. Weighing up the included features with four cooling fans – three of which are RGB, this translates to good value for money. Unfortunately, TD500 isn’t planned for the UK; only US/AU. The MasterBox TD500 stands out from the crowd by bringing something quite unique to the table. A dazzling diamond cut design with RGB is the ideal recipe for style and finesse.